On our second day, we were really looking forward to the big adventure. Early in the morning, we boarded a bus to Digos , 1.5 hours south of Davao City. We went to the old terminal and rented the whole jeepney which took us to the military checkpoint at the base of Camp Sabros. Camp Sabros is located on top of the mountains, the seat of the longest zip line in the Philippines(that time). We were rushing so instead of hiking we rode at the back of some motorcycles to get there. It was my first time to ride one. It was really scary because we are going uphill, and the narrow concrete path is almost like rubble, and 80% muddy and to our right is a very steep drop. 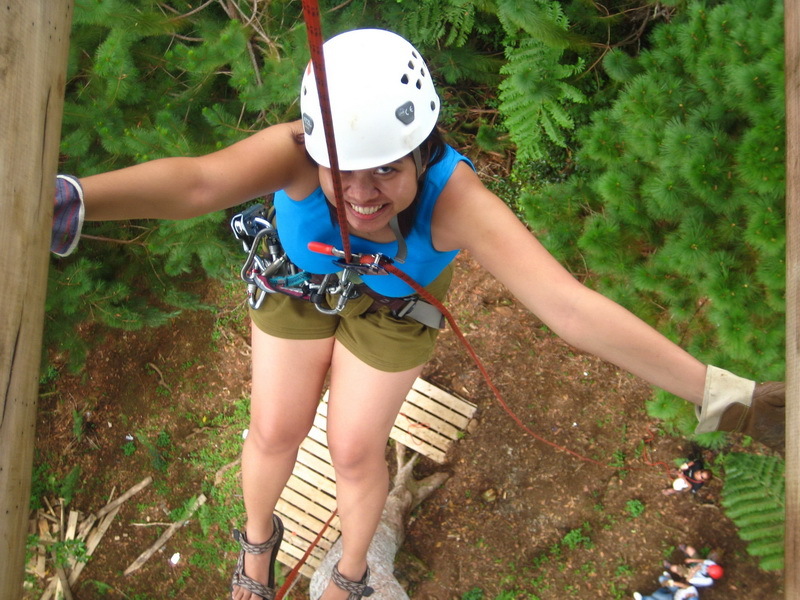 When I heard of Camp Sabros, I told myself I had to try it because I love heights and adventure. Ma'am Cinch and I first did the tandem, we were both hooked on a harness then we flew. The scene is fantastic, it's calming. Secondly, we did the individual zip, they also call it "Superman". The highlight is the longest 400m zip line. It's longer and faster. It's the closest thing you can get to flying. It was really freeing. The place is full of pine trees, with beautiful color rich of green. It's really lovely. The last one we did was the Tree Rappelling. We zipped to a very tall Lauan Tree. Then they harnessed us, and we rappelled down a drop of 80+meters. It was a bit scary though, as if you don't want to let go even though you know you won't fall. The Lauan tree is massive and truly beautiful. The trunk is straight with the wonderful crown spread out above. I often touch the tree and tempted most of the time to hug it. Going up is scarier, the machine pulls us up, but the ticking sound is dreadful. hehe. That night we visited Magsaysay Boulevard for fruit and ate Tuna Kinilaw .